Pumpkin is good for the skin! 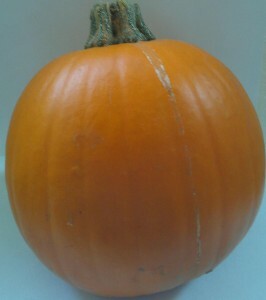 Making pumpkin pie or have some pumpkin leftover from carving Jack-o’-lanterns? Why not reserve some pumpkin purée for making a delectable fall body scrub? It will moisturize and exfoliate your skin and it’s good enough to eat! Plus, it only takes a few minutes to whip up! The pumpkin, full of vitamins and enzymes, nourishes the skin and loosens the bonds between dead skin cells, which are then scrubbed away by the oat flakes and walnuts. Yogurt’s lactic acid content, which is a natural alpha hydroxy, sloughs away dead skin cells and smooths rough skin, too. It also has probiotic benefits, which help with skin renewal and health. The honey, which is a natural humectant, draws moisture to the skin and its antimicrobial properties alleviate skin breakouts. So, this mask is especially great for normal, dry, and oily skin! Makes enough for two applications. Blend together all the ingredients and then apply the scrub in a circular motion to damp skin in the shower or tub. Leave on for up to five minutes, then rinse off well. Enjoy smooth, soft, hydrated skin! Note: This scrub is best used fresh, but it will keep in the refrigerator for a couple of days. Copyright © Karen Peltier and Well Gal, 2012-2013. All rights reserved. ← EWG’s New Cleaning Database is Now Available!